MOSCOW: Coming to Russia and getting beaten by the counter-offensive seems to be Germany’s historical weakness. On Sunday, in a stadium with 78,011 watching, a similar story unfolded as the curse of holders caught up with the Germans. 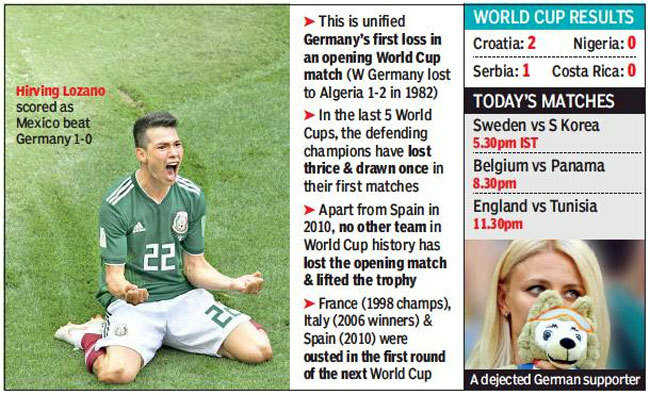 In four of the last five World Cups, the holders had lost their opening encounters, and defending champions Germany fared no better as they were subjected to a famous 0-1 defeat in their opening encounter against Mexico. Marginalising the human element in favour of perfect organisation has its inherent dangers and that was exposed by Mexico. With the technically-gifted Carlos Vela terrorising down the left and the fearless Javier ‘Chicharito’ Hernandez working between the ageing Mats Hummels and Jerome Boateng, the Germans lost the initiative early in the first half. Repeated counterattacks down the same channel left the young German defender Joshua Kimmich chasing shadows and still Joachim Loew failed to read the writing on the wall. The world champions were moving the ball like they had all the time in the world. Breaking it down was rather easy for the Mexicans as the lack of pace and predictability of the defending champions stood out sorely. Winning one such ball quickly with half-hour gone, Vela slipped a fantastic through for Chicharito, who failed to reach it even though the Germans defence was prised open. The signs were ominous. The tag of the world champions was hanging rather loosely outside Manuel Neuer‘s door. A minute later, the unbelievable happened. 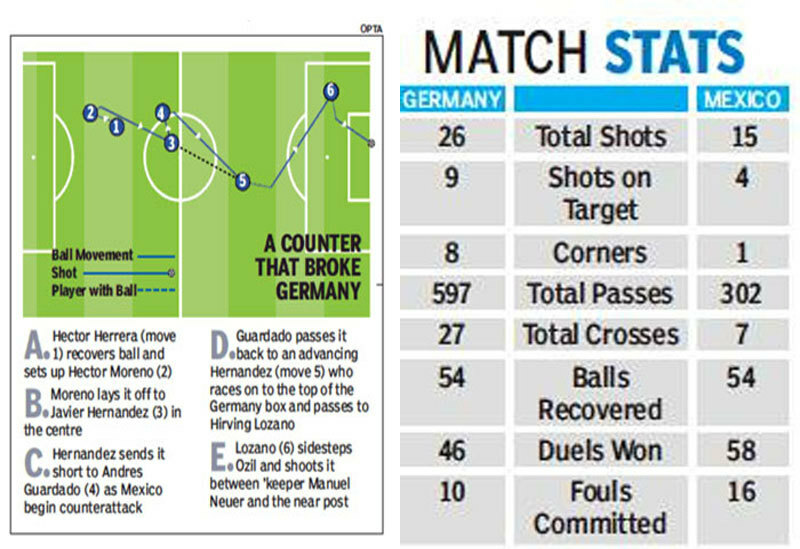 Another ungainly German attack was quickly snuffed out and off dashed Chicharito, like an arrow shot from a sling. Hummels and Boateng were late in changing gears. Sensing that Hirving Lozano was arriving from the channel that Kimmich had left unguarded, the former Manchester United striker weighed his pass perfectly for the PSV striker. Lozano cut inside, fooled a hapless Ozil who was tracking him. Finally finding space, Lozano, just 22, scored the most important goal of his fledgling career with a rightfooted shot that beat Neuer at his near post. Coach Juan Carlos Osorio named him the “future of Mexican football”. 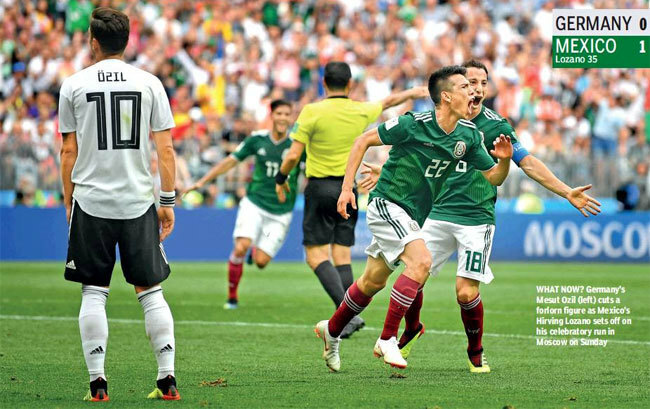 Mexicans fans outnumbered the Germans by three to one inside the stadium and Luzhniki turned green with joy. The sombrero hats and the deep green t-shirts looked far more colourful than the pale white shirts of their opposite numbers. A Jorge Campos-lookalike enjoyed a field day obliging selfie hunters in hordes and the area came alive with the sound of ‘oles’. Germany are known for their propensity to fight back. They are the most dangerous when they are down. The 1974 World Cup final is a fine example of that German grit, when Johan Cruyff ‘s second minute opening goal was overturned by Franz Beckenbauer‘s team on way to winning their second World Cup title. But on Sunday, it was a different script. Apart from substitute Mario Gomez’s attempt late in the game and Kroos’ freekick that came off the upright, it is difficult to remember Thomas Mueller, Julian Draxlar or Timo Werner bothering Guillermo Ochoa under the Mexican bar. What surprised most was Germany’s inability to contain the counter-attacks as Sami Khedira was never in sync with the proceedings. For Toni Kroos, Mesut Ozil and Khedira, the sudden injection of pace by Chicharito and Carlos Vela was too hot to handle. His constant runs and searing pace were the reasons why Vela didn’t last long and was replaced by the defensive-minded Edson Alvarez at the hour. With the change, Mexico switched to trench warfare. They waited for Kroos to pass the ball around but never allowed any daylight to pass through.